It’s strange how some people have the gift to conquer you heart by their kindness. Swati, of Sugarcraft India, is one of those persons. Just less than a month ago, Swati commented on one of my recipes and when I paid a visit back to hers, with a simple question I made about something, I cannot remember what it was about, Swati replied to me by e-mail, giving me the necessary information I needed. We then exchanged other e-mails as well and when I asked her how I could use cardamom, she was kind enough to send me by e-mail two recipes. One of them is Kheer, an Indian rice pudding, which she made especially for me and she sent me the picture as well. The word “Kheer” is derived from the Sanskrit language word “Ksheer”, which means milk. So here we have a rice kheer. I followed her instructions and made it exactly the way she did, the only thing I changed was to use pistachios, instead of cashews (as I did not have any at hand) which I roasted together with the blanched almonds, and I omitted the saffron strands, not that I do not like them but I had only saffron powder at home and I didn’t want to make the pudding yellow. Although I love the Greek Ryzogalo (Rice Pudding) with cinnamon on it, this was entirely different.I fell in love with the smell of cardamom the very first time I crashed the pods to take out the seeds and the addition of nuts and raisins made it even more delicious. I am publishing the photos of cardamom pods and the seeds inside, so that my readers in Greece can learn about this wonderful spice, as cardamom is not well known in Greece. If you have not yet visited Swati’s blog, please do so as apart from seeing art made of sugar you will also meet a very kind person and I am honoured to have made a friend like Swati. Thank you Swati very much. Boil milk and keep cooking on reduced heat for an additional 10-15 min and add the soaked and drained rice to the milk and let it cook on slow heat. Keep stirring in between. It usually takes another 10-15 min for the rice to soften. Add the cloves, raisins, cashews and sugar to the milk. Keep stirring very frequently or it might burn now. Let it cook on slow flame for another 10-12 min …overcooking will evaporate all the milk and that is not the idea so you should look out for a consistency where it does not look too watery and some milk is also seen… add the saffron and take it out in a serving bowl. You can now garnish it with cardamom powder and slivers of almonds. Kheer can be eaten warm and cold.. So see how you like it better!!! Enjoy!!!!! I love rice puddings any way they’re made…this is a great version of it Ivy….Love all the Indian flavours. I’m happy you discovered kheer and enjoyed it. We have so many varieties of this depending on which part of India it is made in. I hope you have the time to try some of them. Ivy, you have been very kind to write so much about me.. Am really touched..It is really very nice to have you in my ” very good friends”.. really wish I could meet you when I visited Greece ..
Glad you made the kheer and enjoyed it so much.. !! 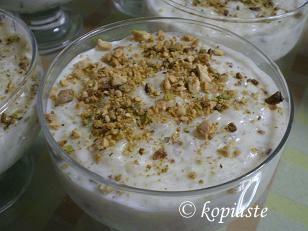 I love kheer and it looks like you did a great job with it! I hope you experiment more with cardamom–its definitely one of my favorite spices! I am so happy to see an Indian dish on your blog….this dish looks perfect Ivy,really its very tempting..Hope to see many more such dishes in r site..
Oh, gosh. I love rice pudding! This looks so creamy and delicious. Cardamom is really good. It’s what of my new favorite spices. This sounds scrumptious with the addition of cardamom and saffron. I just love a good bowl of rice pudding. Have a wonderful relaxing weekend Ivy 😀 I’ve seen really hot temperatures in Greece… maybe it’s time for bathing suits and beach!!! This looks absolutely delicious Ivy – thanks for the recipe!! very nice well written appreciated work.good and informative article.This site makes me stay everyday.Thanks for nice sharing. Simple and yummy tasting food. This weekend will surely try this Indian rice pudding. Hey seems to be very delicious food. Must try this Indian rice pudding recipe this weekend. I like this very much. when we cooking meet we use this. this made meet very very testy.